Nan Ya PCB Corporation used to be one of the business divisions of Nan Ya Plastics Corporation which is part of Formosa Plastics Group and turned into a subsidiary by 1997 as the manufacturer of Printed Circuit Boards (PCBs) and IC Substrates. On the back of the effort made for 50 years, Formosa Plastics Group held position number 323 on "Fortune 500" list in 2009.Therefore, Nan Ya PCB has always been following the guidance of "Diligence and simplicity", "Get to the bottom of one thing", "Keep one's feet in the ground" and "Seek perfection" ruled by two founders of Formosa Plastics Group, Wang Yong-Ching and Wang Yong-Tsai, since then. To keep the belief in mind, we are devoted to deliver the products and services with superior quality to our customers through continuous investment in research and development of technology. 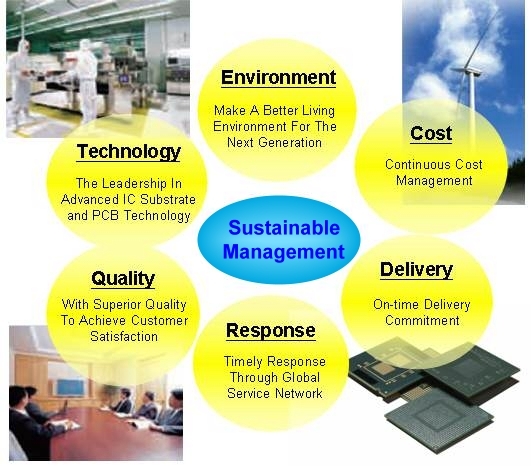 Moreover, by vertical integration, business operations could be more efficient and also eliminate unnecessary waste. In the meanwhile, not only does Nan Ya PCB keep creating the reasonable profit but also focuses on making contributions to the whole society by supporting disadvantage group and participating in social activities. As relying on the solid foundation and business history, we would take full responsibility for customer satisfaction and bring profit to our stockholders by all means.